Note: Throughout this document, components will be numbered corresponding to the order list (1.1). This is to help you identify the component or part that you are working with. The motors will come pre-installed with gold connectors that are too large to connect to the ESCs, begin by cutting them off and stripping some insulation to expose the wire to soldering. Now that you have your motors, we need to connect them to the ESCs (#16 & #17). To do this, male gold connectors (#18) need to be soldered to the wires of the motors which will allow us to make the connection. We will need 3 ESCs (Opto) without BEC and 1 ESC with BEC for a total of 4 per drone. 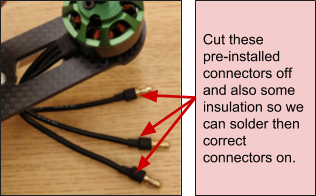 Spread the solder around the opening of the connector to the wires, and make sure to avoid any sharp or jagged edges forming from the solder. Remember to apply heat shrink to the wires after they have been soldered. Pay attention to the same tips when solder, as many still apply. Namely, avoid damaging your electronics with the heat. Next we install the motors, this is as simple as screwing the motors into the corresponding locations on the airframe. Note the difference between the clockwise (CW) and counter-clockwise (CCW) motors (#8 and #9) as they are to be installed corresponding to the autopilots airframe configuration. For the Quadcopter frame that we recommended, the Quanum Outlaw 270 Racer Drone Frame (#1), the motors are to be installed as follows. If your drone frame differs from the one we recommended, install the motors using this reference. First, be sure to insert the provided 8GB microSD card into the slot of the Pixhawk. The Pixhawk will be installed on the back on the Quadcopter with the provided damping foams to reduce vibration. Be sure to install the Pixhawk with the pin outputs facingoutwards, as seen in the following image. The Pixhawk should also not contact the metal spacers of the Quadcopter. You should now also connect the provided Switch + LED and Buzzer. Note: If you are going to use ESCs other than the one we recommended. It is important to first determine if the ESC is compatible with the flight controller. For example, during our own testing, we determined that theTurnigy Multistar BLheli 4in1 ESC was not compatible. 3x(ESC Opto without BEC) and 1x(ESC with BEC) will connect to the 4 motors. Begin by installing the Power distribution board (#15) to the bottom of the Quadcopter using the Vibration absorption sheet (#12). Connect the positive and negative cables of each ESC to the positive and negative terminals on the power distribution board as seen in the following image. It is difficult to guess the correct alignment of the motor wires to the ESC wires. However, if two wires have been put in the incorrect places, then the motor will spin in the other direction. If this is the case, then it can be resolved by simply swapping any two of the connections. Thus, when testing for proper wiring, it is useful to tape the wires with colored tape once you have everything correctly matched up. Finally connect every servo cable from each ESC to the Pixhawk using the following diagram. Pay attention to the motor numbering and where it connects on the Pixhawk. Up to a total of 8 motors can be connected to the Pixhawk flight controller corresponding to the 8 MAIN outputs. If you are using a different ESC with a newer D-shot protocol instead of PWM, you will need to rather use the auxiliary outputs. D-shot will not be covered in our documentation. Installing the Receiver is as simple as connecting the servo cable from the receiver to the RC port on the Pixhawk. Note: The Receiver wiring is incorrect, we will resolve this issue in the following report. The batteries are to be charged using the Turnigy ACCUCELL S60 (#14) with the following specifications. Be sure to connect the balance plug along with the discharge plug. This is to ensure that the battery charges safely and that all cells are balanced during the charging. The otus tracker is to be placed on the front of the drone, right next to the battery. The Otus tracker is to be installed with the provided vibration damping adhesives. Install the silver propellers on the CW motors and the black propellers on the CCW motors. A propeller balancer is also recommended, as severe vibrations can ruin your telemetry and potentially damage components on board. Please note that screw on propellers like the one we recommended cannot be used with a propeller balancer. The PX4 user guide is an excellent resource for setting up your first quadcopter using a pixhawk with PX4. It should have all the information you need in regards to wiring your flight controller. The wiring overview is included below, for your reference in case you would like to add additional hardware to the Pixhawk. 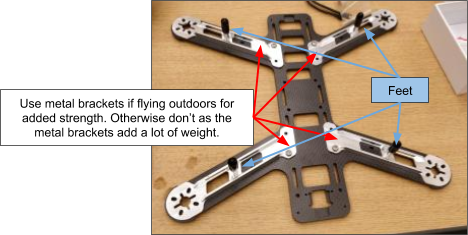 Once the quadcopter has been assembled, it is recommended that you reduce the lengths of the cables that are too long & then resolder the connectors. This will give the quadcopter a clean look and also prevent any wires from getting caught in the spinning propellers.